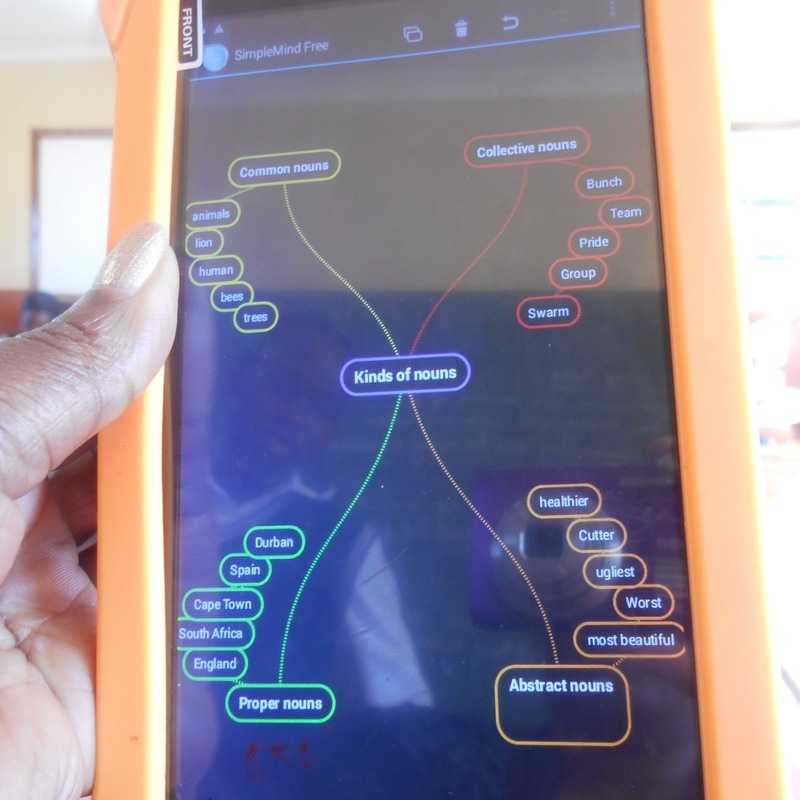 This is the 19th post in the series "MIEExpert Spotlight" for South Africa. The tab with all the posts can be found at http://bit.ly/1ZYy8Z7. Today we focus on Nosithembele Gcobo from Sentile Junior Secondary School in Queenstown. Nosithembele teaches Grade 6 at a rural school where using technology is a challenge. In this post she shares some of the challenges with ICT in rural settings and shows how she has worked at overcoming these challenges. Integrating ICT in curriculum practice is not as easy as it could be in the rural context such as in Cofimvaba where I teach. The challenges we face as teachers make it impossible, sometimes, to fully realise the benefits offered by ICT. 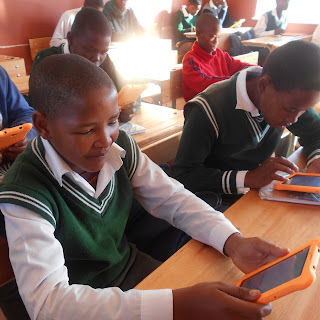 For example the ICT infrastructure (WIFI, content server; mobile devices etc) can be the major barriers in the contribution to the improvement in the quality of teaching and learning in rural schools. I have found, though, that one way of overcoming challenges like this is to focus on the available tool that can be used to incorporate the technological part of the curriculum. The Grade 6 learners have the responsibility of charging their mobile devices, checking the condition of their mobile devices and reporting whatever problems they have. They do this every time they use their mobile device. Here are four lessons I have done (or am planning to do) in Grade 6 with my learners where I focus on a particular program. I decided to do a biography project in Grade 6. This was a third term project where my Grade 6 learners had to write a biography about someone who has made a difference in our country, South Africa. They did their research using text books, the Internet and also by questioning their families, and their teachers. 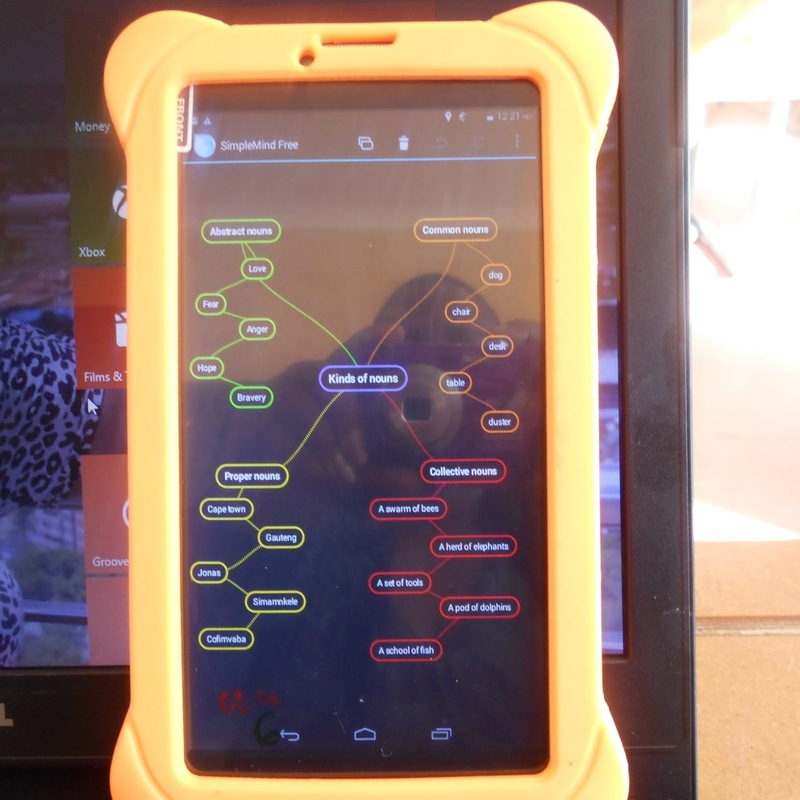 After gathering enough information for the project, they used Microsoft Word to write the project on their mobile devices. As the beginners, they were able to showcase their typing skills, inserting pictures and taking photos thus creating a standard document. 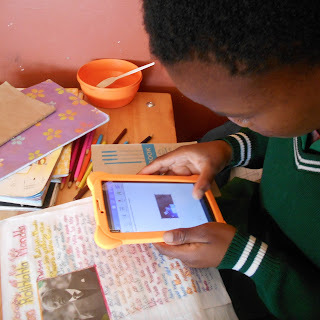 As a Grade 6 teacher, I always make sure that in every subject my learners use the mobile devices. I use a mindmapping program called Simple Mind where the learners can show their creative skills. Mindmapping helps my learners to master the content in a better way. This screenshot is an example of a First Additional Language – Lesson on Nouns. I love using Sway. It is easy to use and you can record events that happen. Here is a Sway I made which records a few events. I have learned how to make videos and upload them to YouTube. I want to do this with my learners eventually. This is a video I made when i entered the Microsoft Innovative Educator Expert program. I am hoping that as time goes the challenges get less and less. 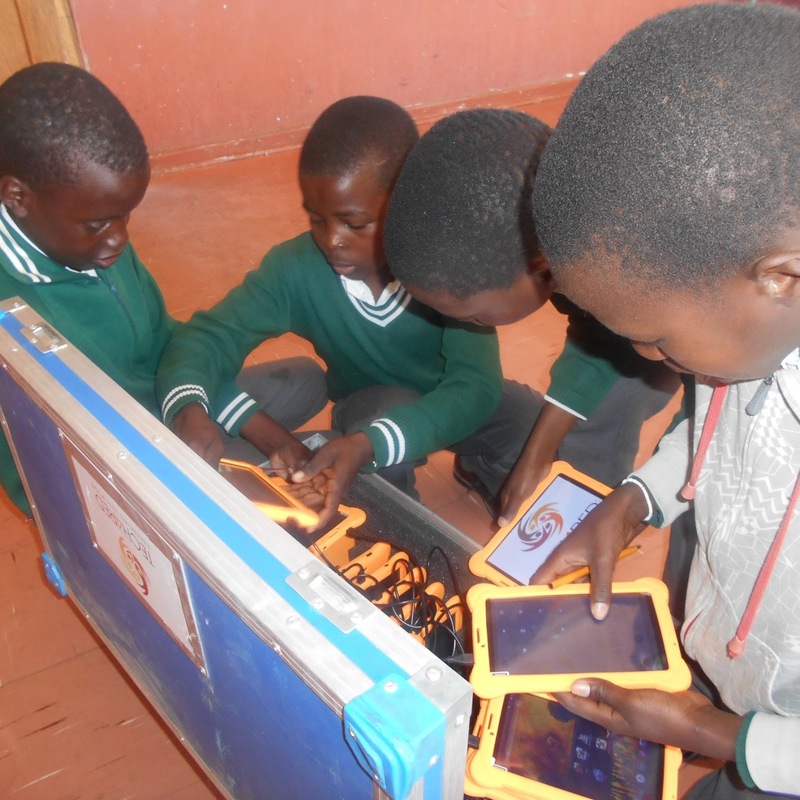 ICT integration adds value and provides clear guidelines on how to approach ordinary lessons and change them into experiential learning activities. Pedagogically, ICT is creating tech-savvy learners by changing the way they learn as it provides opportunities for them to operate in the current information age. If you are a teacher who likes to be innovative in the classroom, think about entering Microsoft's Innovative Teacher MIEExpert program in 2017 when applications reopen later. You can learn more about the program at this link: http://bit.ly/1H4gKcB on the Microsoft Educator Community. Are you up to the challenge of the Hour of Code™? The Hour of Code is a global campaign to demystify code and encourage everybody to learn the basics of computer science. Microsoft is proud to be a founding partner of Code.org. and together they have developed some great Minecraft themed tutorials to introduce basic coding concepts. Globally the Hour of Code campaign is held during Computer Science Education Week (5 – 11 December 2016). During the campaign, individuals and groups around the world participate in a variety of one-hour introductory learn-to-code experiences and there is lots of buzz on social media using #HourOfCode. Of course – you can work through the Hour of Code materials any time you like – and are not limited to just this one week when coding is celebrated. If you are looking for a fun activity to try with your learners during the last few days of school consider taking on the Hour of Code challenge as a class. Learners can work through one of the two Minecraft themed Hour of Code tutorials here https://code.org/minecraft and the teacher can download the facilitator guide and PowerPoint decks here https://docs.com/hourofcode2016/6548/english. If you are a parent looking for free, fun activities for your own children to do in the holidays – why not challenge them to completing an Hour of Code? If you are looking to learn a new skill over the holidays – give the online code.org tutorials a go yourself and share your creation using #Hour of Code. Can anyone run an Hour of Code™ workshop? Absolutely! The online tutorials and ready-made PowerPoints make it easy for anyone to run a workshop. If you are keen to run a session download the facilitator materials here and work through the online tutorials yourself here and you will be ready to roll. I can’t attend or run an Hour of Code™ Workshop – can I still participate? Yes! Give the online tutorials a try and share your finished product on social media using #HourOfCode so that others can see you completed the challenge. You can even print out your own certificate at the end. What age groups is the Hour of Code™ aimed at? The Hour of Code™ materials are aimed at learners between the ages of 8 and 18 - with one set of materials for primary school learners and one set for high school learners. We would suggest that workshops be offered to learners between grade 3 and grade 11. Please note that the workshop materials are in English and do require some reading. These materials are meant to be a basic introduction to coding - they may seem simplistic for Computer Studies learners although people with some prior coding experience will be able to show off their skills in the final challenges. What technology is required to complete the Hour of Code™ tutorials? Each participant will need access to a computer, laptop or tablet with a modern browser that is connected to the Internet. Headphones for each learner would be a great help – as well as a data projector and speakers for the facilitator. If your Internet connection isn’t great you can download the materials in advance or you could download the videos and show these to the whole class instead of each child watching them individually. 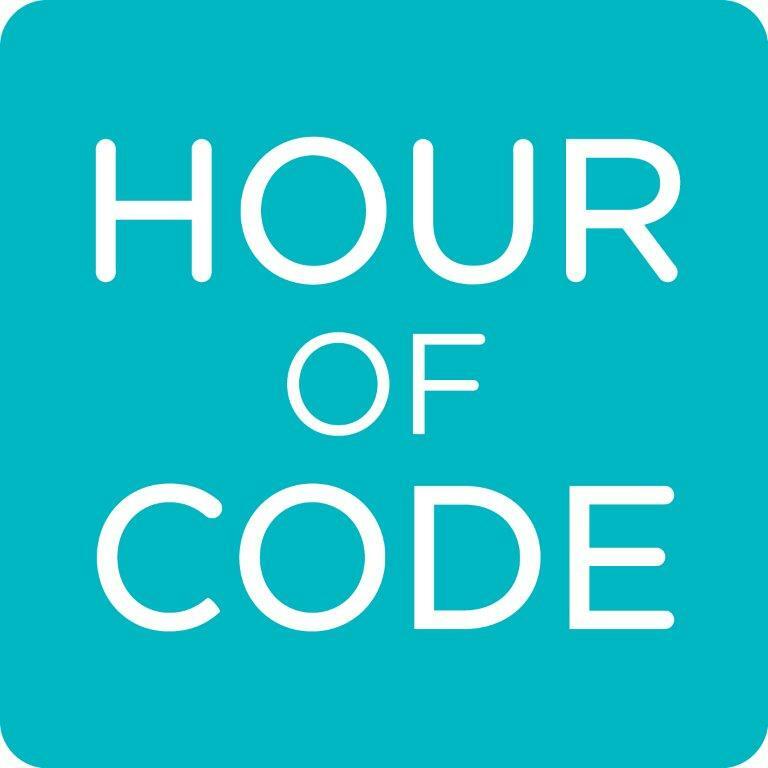 How can we share what our school is doing as part of the Hour of Code™? Please post your photos and stories on social media to tell us and the world what you are doing to get learners coding. Use the hashtag #HourOfCode and tag @MicrosoftSA. 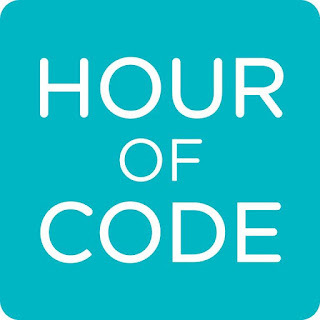 Will learners get certificates for participating in the Hour of Code™ ? Once someone has completed the Hour of Code™ they can download a certificate. There is also an option for the facilitator to print up to 30 certificates in a batch if this is an activity which you would like to try with a class of learners. SchoolNet SA is not able to print certificates for people completing the Hour of Code. Do learners need access to Minecraft to participate? The materials that will be used in these workshops use characters and concepts from the Minecraft video game, but not the game itself. Learners DO NOT need to have access to Minecraft to participate in these workshops nor do they need any knowledge of Minecraft. Of course, learners who already know and love Minecraft will be excited to see familiar characters and concepts from the game. Do learners need to have computer skills to participate in the Hour of Code™? The whole idea of the Hour of Code™ is to get students excited about coding. No prior coding skills or experience are required. That being said - the workshop will work better with learners who have some computer literacy or those with an interest in computers. On Thursday afternoon 24 November at 3:30pm we held a webinar entitled, ‘'ABC learning - Create spelling videos using PowerPoint'. Our speaker was Mochudu Machaba, a South African educator presently teaching Grade 5 and 6 Social Sciences, English and Lifeskills at Ngwanamago Primary Limpopo Province. In this webinar, Mochudu showed us how learners can create vocabulary content using PowerPoint. She demonstrated how learners can design PowerPoint videos to revise their language structure and help them improve their vocabulary. Visuals improve their memory to recall what they have learned and also help them understand words better by relating the vocabulary to pictures. In this lesson learners come up with words and pictures to create their own spelling words. Learners record themselves saying words and later come up with sentences. In this way learners’ confidence is enhanced because they create their own content. They can use either Sepedi or English. They then rehearse what they have created and do creative writing as well. The webinar recording can be listened to on the following link on YouTube: https://youtu.be/rLwkK-bG8 To or it can be viewed in the embedded video below. Summary: In this webinar, Mochudu will show us how learners can creating vocabulary content using PowerPoint. She will domonstrate how learners can design PowerPoint videos to revise their language structure and help them improve their vocabulary. Visuals improve their memory to recall what they have learned and also help them understand words better by relating the vocabulary to pictures. In this lesson learners should come up with words and pictures to create their own spelling words. Learners will record themselves saying words and later coming up with sentences. In this way learners’ confidence is enhanced because they will create their own content. They can use either Sepedi or English. They will then rehearse what they have created and do creative writing as well. Presenter: Mokhudu Machaba is a South African teacher and a current MIEExpert and Microsoft Master Trainer. She has won many awards in ICT since 2009. Lately she has been honoured by the minister of Public Service and Administration (Adv. Ngoako Ramathlodi) for leading Innovation in the Public sector. Mochudu became a Microsoft Certified Educator in 2015. I am sure you have asked your students to conduct a survey at some time. It is a great way to get them to generate their own data, rather than relying on you or the Internet to provide stats. But, it can be a rather lower-order activity if all they do is collect data. They need to be working with it, trying to answer a question or solve a problem. So there needs to be some playing with the data once it is collected, aka manipulating variables. For example, students might want to ask the question: “Who uses what kind of social media?” If they get an answer, they can then be challenged to ask why that might be the case, to come with a theory to explain their findings. This blog post describes a process whereby data is collected in Excel Online via a survey, then processed in Excel Desktop using Pivot Tables and Charts to allow students to see if the variables they have chosen do or do not have an effect. This is a cognitively powerful process – first it provides a way to take the raw, chaotic data of the world, and order it; then it facilitates visualising the patterns in the data, thereby making thinking visual. The first step is to use the Online version of Excel by logging into your Microsoft OneDrive account. Click on New, and choose Excel Survey. At this point, you will need to decide on what information you want to collect. What is very important is to collect Independent Variable (IV) and Dependent Variables (DV). IV – information that defines who or what is being studied; eg as a researcher I have a hunch that gender and age play a part in determining what social media people use; so I would need gender and age as my IVs. DV – this is information that will allow us to measure the effect of our IVs, eg frequency of social media use, and which platform. To make your life easier, choose categories for the age groups. Once the data has been collected, it is time to start analysing it. drag one of the IVs (eg Gender) to the ROWS box – you will see it now breaks down the data by this IV. drag one of your DVs (eg Social Media Platform) to COLUMNS – this is the magic part! The data is now broken down two ways. So, we have an answer to our question. But it is quite hard to read the data in the table. So, we need to create a chart. Click anywhere in the Pivot Table, and then click on Insert > Column or Bar Chart. Select the 3-D 100% Stacked Column format. An interesting aside is that once the Pivot Table and Chart have been set up, they are available to be used in Excel Online – you just can’t create them there. If you are a teacher who likes to be innovative in the classroom, think about entering Microsoft's Innovative Teacher MIEExpert program in 2017 when applications reopen. You can learn more about the program at this link: http://bit.ly/1H4gKcB on the Microsoft Educator Community. Microsoft’s Annual Skype-a-thon on 29th or 30th November. You can find more details about it at www.skypeathon.com. One of the exciting offers from Microsoft is: Microsoft is looking for a class in South Africa that would like a Skype Session with Zoaib Hoosen, MD for Microsoft South Africa, as part of this event. Exciting! This would be a 30 minute event. Interested? Zoab will skype with one lucky class! In the comment box in this Facebook post on the Microsoft page, http://bit.ly/2g1DJA7, write your school’s name, why we should choose your class and what you would like to hear about from Zoaib. What is the annual Skype-a-thon event? 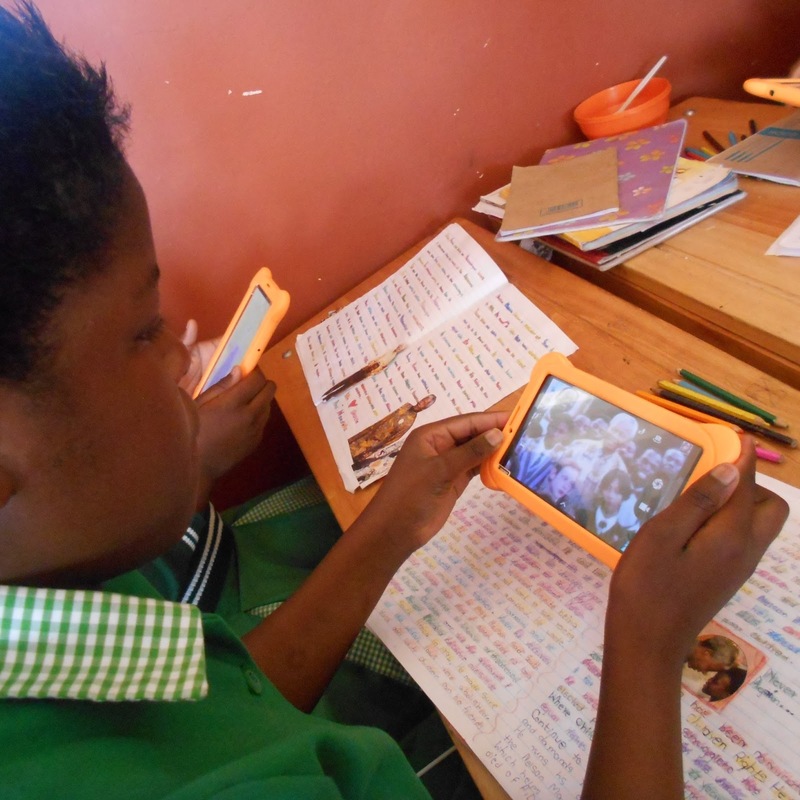 Microsoft’s Skype-a-Thon is a global movement to celebrate learning without borders. Last year, over the course of the two-day event, thousands of educators, guest speakers and students travelled 3,046,124 virtual miles (for South Africans this would be 4 902 261 virtual kilometres). This November 29-30th, you can join the thousands of educators around the world already embracing the global learning movement and celebrate learning without borders! 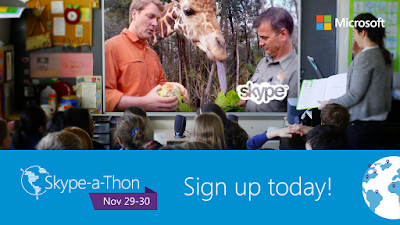 Help Microsoft celebrate global learning by joining us in the Skype-a-Thon mission to travel 3 million miles over Skype on November 29th and 30th. Visit the Microsoft Educator Network (https://education.microsoft.com/skypeathon). This page will show you how you can participate in three easy steps. By the way, if you haven’t joined the amazing Microsoft Educator Network now is the time to do so! Register today for this year’s Skype-a-Thon (Nov 29-30) and join thousands of other students, educators and guest speakers around the world as they connect with and learn from each other via Skype! This could be an unforgettable event for your class to participate in! This could be one of your Skype calls during the day! What do you need in your classroom to participate? * Think about a creative idea on what to talk about. e.g teach Zoaib something about your school/culture; talking about jobs of the future, Q&A session talking technology, find out more about Microsoft, discuss the future of technology, information about your respective towns, sharing interesting lessons, etc. The ball is in your court! If you are keen to do this please go to this Microsoft Facebook link http://bit.ly/2g1DJA7 and write your response there. Visit: www.skypeathon.com for more info. Tuesday, November 15th, is day three of the seventh annual Global Education Conference. We are ready for another great day of sessions and keynotes! Why Baki Matters II: Stories and Projects from Silk Road - Melda Yildiz, Ed.D. KEYNOTE: Kevin Smith - "Global Competence and Dual Language Programming: A purposeful, systematic integration of language and culture"
KEYNOTE: Beate Nguyen, MA.Ed. - "Global Ed (Urgent Action + Critical Lens)"
KEYNOTE: Tudor Clee - "Sharing the kids eye view of the world"